Remember International Waffle day a few days ago? If you haven’t seen the post on Marion Cunningham’s Waffles, take a peek. Wonderful waffles, I’m sure, in a standard Waffle iron, but not so good as Belgian Waffles. I simply had to revisit that recipe and make them one more time with my suggested modifications – and here they are, in all their glory, adapted. I have to say these were the best waffles I’ve made and far surpassed an old recipe I used to use – which I always thought was good – before I had these. These waffles have a beautifully crispy exterior and soft, moist, fluffy interior, and are slightly sweet with a yeasty flavor. They are heaven on a plate. Perfect enough to rate pulling out of the good Maple Syrup! You can see in the photos how beautifully crispy they are – each stands off the other and holds it’s shape even though they aren’t touching the plate. There wasn’t a loser in the bunch, not even the standard first waffle “sacrifice.” The only flaw? Tiny miniscule bubbles and pits across the top edges. I may work on that sometime, but they were barely noticeable to the eye although the camera picked up on them. Marion Cunningham’s Waffles adapted for Belgian Waffle Maker. A few pits are the only flaw; barely noticeable to the naked eye, but more pronounced in the photos. My assumption is that the batter, being thicker and needing to be spread across the iron, cooked just a little more unevenly. Or perhaps it was the little bit of extra baking soda I added or the touch more sugar. The modified version of the original recipe showed a very slight pitting, although not quite as pronounced as these. Regardless, they were so good, the texture so perfect that I think I can live with that one small flaw. We’ll see! You’ll know if I can’t because they’ll be yet another waffle post, not necessarily a bad thing, eh? (That’s my Minnesotan accent coming out, that “eh” even though I’m a transplant.) You betcha! So incredibly crispy outside & creamy inside. Look how they stand off the plate. If there are any waffle experts who might point me in the right direction, I’d appreciate any comments. What I did lose from Marion Cunningham’s original recipe was just a bit of the ethereal lightness, which I didn’t mind. In a Belgian style waffle, at least an American Belgian Waffle, it’s nice to have the soft, creamy inside as a contrast to the crispy exterior. These waffles are very yeasty, with a sourdough like flavor, and just a whisper of sweetness. Marion used only a teaspoon of sugar, which was a bit spartan for my taste. I’d suggest between a tablespoon and four, and my preference is the higher amount. It’s easy enough to start out the overnight proofing with just a tablespoon of sugar and make the first waffle. Then decide if you’d like to add more, keeping in mind what you’re going to be serving over the waffle. Marion Cunninham’s Waffles, adapted. So incredibly crisp, yet creamy inside. Use a rather large mixing bowl — the batter will rise to double its original volume. Put the water in the mixing bowl and sprinkle in the yeast. Let stand to dissolve for 5 minutes. Add the milk, butter, salt, sugar, and flour to the yeast mixture and beat until smooth and blended. Cover the bowl with plastic wrap and let stand overnight at room temperature. Just before cooking the waffles, preheat oven to 200 degrees. Lightly beat the eggs, add to batter along with the baking soda and stir until well mixed. Spread about 3/4 cup batter across a very hot waffle iron. Bake the waffles until they are golden and crisp. As each waffle is done, place directly on the rack of the oven for several minutes. This is not simply a way to hold the waffles until all are ready to serve, but an integral part of the recipe. 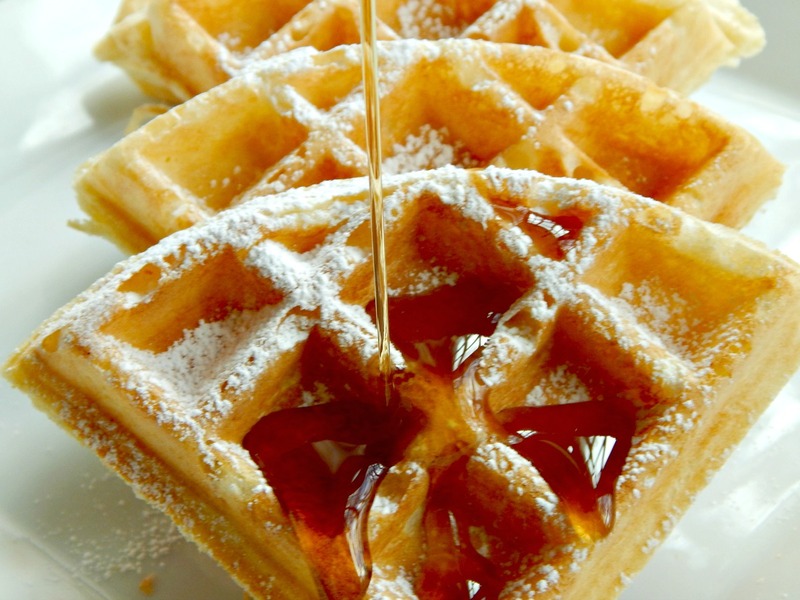 The waffles will not remain crisp for more than two or three minutes without this process. Most waffles freeze very well. Reheat in toaster, toaster oven or oven, directly on a rack. This entry was posted in Click here for Bargain Meals, Click here for Fabulous Food Posts and tagged Belgian, Breakfast or Brunch Dish, Easy Recipe, Eggs, Fanny Farmer, Freezes Well, Frugal Hausfrau, Make Ahead, Marion Cunningham, waffles. Bookmark the permalink. Yumm!!! They look so delicious! These look yummy. I usually make pancakes but hubby loves waffles. This looks like a win win! I had an old one that was my Grandma’s then my Mom’s, but it was a bit dangerous! Then years later, I had just a standard and it never made good waffles. I was always mad at it! Now I have a fancy turn model (they’ve come down in price) just because I love waffles! I don’t have too many things in my kitchen that are highly specialized, but the waffle maker is one! Sorry for the mess of a post. I miss being able to edit after I’ve accidentally hit send. In any case, I inherited a reversible waffle iron/grill from my mom. The grill part works really well but I still haven’t got the hang of the waffle iron part … or it’s just not seasoned properly yet. Is it a stovetop one? No, it’s an old plug in gadget made by Toastess with reversible plates. There is a picture of the grill with one of each of the plates showing here. Preheat longer than you’d think is necessary – until a few drops of water dance and sizzle away. Keep the lid down until the last second before you add the batter. Just before adding batter, give it a spritz of cooking spray. You shouldn’t need to do this after you’ve made a few batches. Last, make sure to cook them long enough. You have to rely on smell, too, to judge. That smell that tells you something is going to be crispy and delish! If you start to lift the lid and anything sticks, put the lid back down immediately. If it sticks as the top lid is lifted, it will likely be sticking on the bottom, too. As soon as the first is out, put the lid back down to reheat. Give it a moment or two before adding the batter for the next waffle. Hope that helps! And happy waffling! Thank you for the advice. I’d definitely be interested in your waffle recipe. Maybe I’ll give them a try this weekend. I’ve been brushing the hot waffle iron plates with vegetable oil in the past but still got sticking. I think I’ve got the timing close … around 4 minutes. One of my favorite food groups! Looks so ready for Sunday Brunch. They look pretty darn good, and I’m sure taste even better. Thanks, Loretta! 🙂 Maybe it’s a personal preference, but I do like the crispiness on the outside of a waffle! They look perfect to me! But then, I’m no connoisseur…! Thanks, Elaine! They’re not too good for you, especially with syrup = luckily they’re self-limiting. Too much of a pain to make too often! Ha ha! Self regulating waffles!! Must try this recipe, it looks amazing! I had a friend who was stuck as a teenager on the way to Greece, for hours, a student exchange thing. They were fed Feta and Olives, neither of which had tasted before and wasn’t able to embrace and to this day, she still doesn’t like Greek food!